Nu-Tech manufacture both Positive and Adjustable chokes in pressure rating up to 15,000 psi WP. With different style of end connection. Adjustable Chokes are meant for variable flow. It has externally controlled indicator showing orifice size in the increment of 1/64th inch. The variation in choke size is achieved by rotating hand wheel to obtain desired flow rate at down stream side. Interchangeability of parts to construct a positive, adjustable, or combination choke. Bonnet nut has rugged integrally forged lugs for hammering nut loose. Built-in safety feature which releases residual pressure in the choke body before the nut is fully removed. The inside of the choke body is vented to atmosphere after the bonnet nut is partially removed. 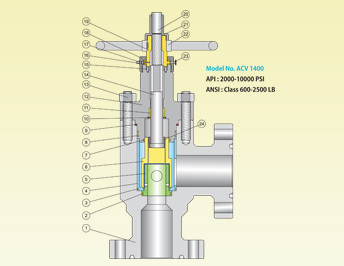 Interchangeability of component parts for a particular pressure range. For example, the same blanking plugs and bonnet assemblies are used in nominal 2” 2000 through 10,000 psi WP . Stainless steel adjustable choke needle and seat (Tungsten Carbide/Ceramic lining needle and seat also available for severe service applications) Different end connections (API / ANSI, flanged / Threaded) are available upon request. Positive Chokes accommodate fixed orifice dimensions. All Nu-Tech Adjustable Chokes can be converted into Positive Chokes by replacing the bonnet assembly with an appropriate blanking plug assembly and choke bean . Nu-Tech Bean Wrench come with hexagonal socket box for Bean Adapter and Bean separately. The Adjustable choke seat and Bean Adapter are accommodated in same wrench for a particular size . Nu-Tech External sleeve control chokes minimize erosion and improve flow characteristics suitably for erosive service and under high pressure drop, with sand concentration. It applies the principle of “flow Impingement” to dissipate and contain the destructive forces of cavitation, within the heavy duty thick walled cage of tungsten carbide . 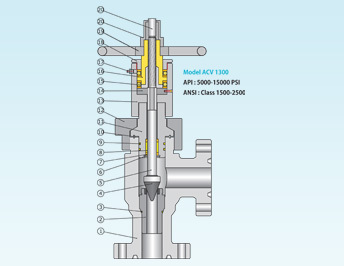 Spring loaded pressure energized stem seal. Field proven metal bonnet seal .